DO YOU REMEMBER THIS FROM TWENTY FIVE YEARS AGO? Only 2 weeks till Smokey Bear Days, come join us May 5-6 in Capitan, New Mexico! 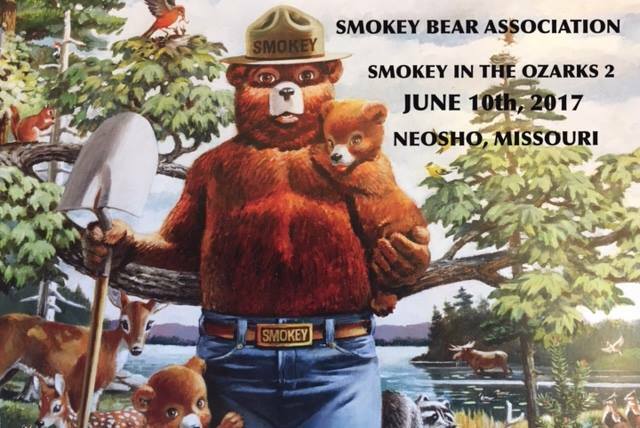 Just a reminder that we are hosting the Smokey in the Ozarks, a Central Regional Get Together, on Saturday, June 10, 2017, at our home outside of Neosho, Missouri. This meeting is open to all members regardless of which region you live in. Since we are centrally located, I would love to have members from all regions attend. If you are planning to attend the Western district meeting, you could come to Missouri on your way to Oregon!! We will plan to start our meeting at 9:00. We will have some fun door prizes, buy and sell tables, as well as give away tables. Everyone is welcome to bring a door prize, and any items you wish to sell, trade, or give away. There will be plenty of time to get reacquainted with all of your Smokey friends that you haven’t seen in a while. We will be cooking burgers for lunch and smoked brisket for dinner, all from Smokey’s BBQ shack. Since we live ten miles outside of Neosho, and approximately 20 miles from Joplin, I would suggest that you stay in Joplin. They have a great variety of motels and eating establishments, all conveniently located off of I-44. If you need any help picking a motel, let us know, and we will be more than happy to assist. There is only one motel in Neosho that I would recommend, and that would be the Best Western. Once we have a tentative list of attendees, we will be sending out a map of how to get to our home. Weather permitting, we will be inside, outside by the pool, or in the picnic pavilion. Anyone wishing to swim, feel free to bring a suit. Should you have any suggestions, please don’t hesitate to let us know, since we are new to hosting this meeting! You can contact us at either of the numbers listed below. Please let us know if you plan on attending so we know how much food to prepare. We certainly are looking forward to hearing from all of our Smokey friends!!! . 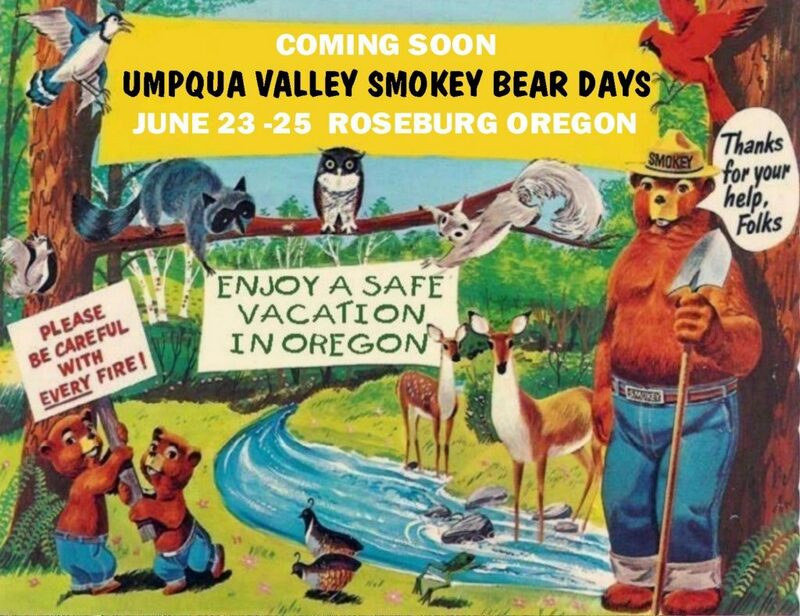 The Smokey Bear Association will be holding their Western Regional Gathering this June in Roseburg, Oregon. The three day event will be held at the Sleep Inn & Suites Roseburg June 23 – 25th. Smokey Bear enthusiast from around the West are invited to attend this semi-annual event being hosted by Jack, Nancy and Marian Winchell. Please note that this gathering in open to all SBA members and non members from across the United States. We are expecting SBA members and Smokey Bear fans from all over the West Coast to make the trek to Roseburg so if you are looking to buy, sell, or trade Smokey Bear items please plan on attending. 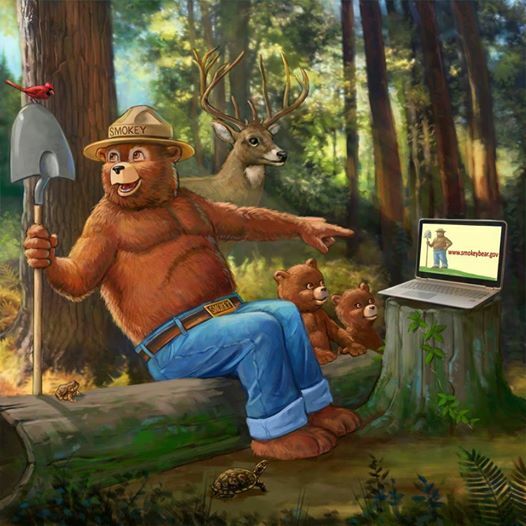 This years event well be a laid-back gathering that should be fun for all and a great time to catch up with old friends and Smokey Bear enthusiasts. Please contact me if you have any questions. We hope to see you in June. The Smokey Bear Association a nationwide association of friend,fans and collectors of Smokey Bear will hold it’s three day Smokey on the Lake convention in Coeur d’Alene April 18 – 20 at the Coeur d’Alene Resort. On Tuesday April 19 from 3:30 – 7:00pm the SBA will hold a open house for the public in conjunction with the Greater Kootenai County Fire Prevention Cooperative and Shoshone County Fire Prevention Co-op. Highlighting the open house will be free give-aways, Facebook photos with Smokey Bear, Smokey Bear Cake Decorating awards and tasting, Smokey Bear Coloring Contest display & awards. Smokey Bear Collectors Road Show as well as exhibits and Smokey Bear items for sale. Shoshone County Fire Prevention Co-op will present the “Fire Safety Showdown”skit twice during the evening and the Greater Kootenai County Fire Prevention Cooperative will be handing out free Smokey Bear and Fire Prevention items, as well as displaying firetrucks and other apparatus. Come and meet Smokey Bear, enjoy some free cake, have your picture taken with Smokey for posting on the new Idaho Smokey Bear facebook page and then check out some rare and one of kind Smokey Bear collectibles. Get to know and thank your local Fire Safety Professionals while learning how to keep your home and Smokey’s Forest safe. Bring your cherished Smokey Bear item and learn it’s history and value while you met and great Smokey Bear and all his friends. Convention fees due April 1st. Room Rates: per night, single/double occupancy. 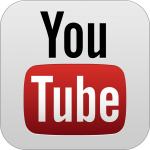 receive the SBA discounted quoted rate. If you have a joint membership, please print both first names and then last name. Registration Fees includes all convention materials and banquet fee. The Smokey Bear Association a nation wide group of Smokey Bear friends, fans and collectors will be holding their Western Regional Gathering this year in Douglas County. This three day event will be held in Roseburg May 15 – 17. Smokey Bear enthusiast from around the West will be attending this semi-annual event. As part of the Smokey Bear Association’s goal to promote Smokey Bear and his fire prevention message Saturday May 16th. 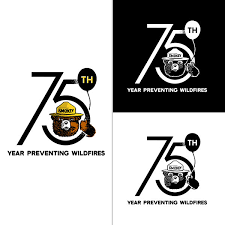 2:00-4:00pm the SBA and the Douglas County Museum will co-sponsor a celebration of Smokey’s 71 Years of Fire Prevention service. The celebration will be in conjunction with the Douglas Forest Protective Association, Umpqua National Forest and the Keep Oregon Green Association’s month long Wildfire Awareness Program. The museum will open it’s door to children and adults from around the Douglas County area who are invited to attend this fun, informative, and free activity. Fantastic display by Smokey Zone of Bend Oregon who will be setting up a similar display at Smokey’s Cascade Campout April 23-25 in Bend Oregon.